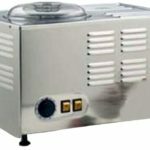 Whether you intend to make frozen desserts for home or professional use, the Lello Musso Pola is an amazing ice-cream and gelato maker..
What Makes the Lello Musso Pola 5030 the Best Gelato Maker? The Lello Musso Pola is an all stainless steel construction. This includes the bowl and blade. Since most home ice cream makers have aluminum bowls and plastic parts, this gives Lello a huge advantage over the others. Your ice cream will freeze better and faster and taste smoother. Since the bowl is not removable, there is no gap letting cold air escape. High rate of output: The Musso Pola 5030 can make up to 6 quarts of ice cream, frozen yogurt, or gelato in an hour! Make a variety of flavors back to back for the perfect ice cream bar. Ice cream goes from pouring in mix to frozen and ready to eat in a mere 20 minutes. Made in Italy. Made to last. 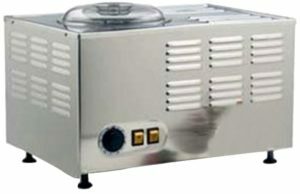 Self-contained freezing unit keeps your frozen desserts frozen even after they’re ready. The Musso Pola makes fabulous frozen desserts! Rich and creamy ice cream, not too light, not too dense. Gelato that tastes like it’s straight out of Italy. Perfect fruity sorbets. Over 80 reviews with an average of 4.5 stars shows that owners are satisfied with the king of gelato machines. The Lello Musso Pola 5030 is the best tabletop model of commercial ice cream makers, making it perfect for either commercial or home use. As you can imagine then, this is a large machine, but fortunately still fits on a counter. Measures 20 x 14 x 12.2 inches. Uses 110 voltage and has a standard US plug. With all the yummy treats you’ll be able to make with the 5030, you’ll want to have easy access to this machine. If the Pola 5030 is just too big for your space, consider the smaller Lello Musso Lussino 4080. It makes delicious ice cream just like the Pola 5030, but has a smaller 1.5 quart capacity. Other gelato makers can only bust out 1.5 quarts per hour of ice cream or gelato. The Pola 5030 can make up to 6 quarts of ice cream, frozen yogurt, or gelato in an hour! A single batch on the 5030 can complete in about 20 minutes which is super fast compared to other machines. How many servings of Ice-cream or gelato is that? One batch can produce up to 2 quarts. Serving size for ice-cream is about 1/2 cups, but most people go for 1 cup serving size. With 4 cups per quart, and a batch size of 2 quarts, the 5030 can produce 8 servings in just 20 minutes, and that’s at the larger serving size! It can produce 16 servings if you opt for the smaller serving size of 1/2 cup which is great for gelato, and still allow for guests to go back for seconds! The 5030 is a great option for a self-refrigerating ice-cream maker because of it’s speed and capacity and industrial strength quality. Compared to other ice-cream & gelato makers, the blade is not plastic, it’s stainless steel which means it’s tough and will last a much longer than other gelato/ice cream machines with plastic parts. If you’re going to make lots of Gelato or Ice Cream, the Lello Musso Pola 5030 is the best fit. With it’s increased capacity, speed, and longer lasting stainless steel components, the Lello 5030 will hold up to even the toughest demands. That means, more ice cream or gelato, and a better value as it takes less time, and is built tough. But with its ease of use, the 5030 brings the durability of industrial strength without the complications of a million knobs and switches. The Musso Pola is the right balance between high capacity and ease of use. Some are initially concerned about clean-up since the stainless steel bowl is not removable. They soon learn that clean-up is a breeze. There are no seams or crevices since the bowl is actually part of the whole unit. Simply wipe clean with a kitchen towel or sponge and soapy water. Most people report cleaning the bowl takes no longer than 2 minutes. That’s incredibly fast compared to the messy cleanup of other machines. To make clean-up even easier, let the machine sit for a few minutes so the ice cream residue melts. How firm do you like your ice cream? When using the high-end Lello Musso Pola 5030, your ice cream is frozen and ready to consume in a mere 20 minutes. However, this is near soft serve consistency. If you want it firmer, you can adjust the hardness of your ice cream by increasing the amount of time you leave it in the Musso Pola. Bonus: You don’t need to chill the ingredients! Since this machine is self-refrigerating, there is no need to chill the ingredients. If you want to speed up the freezing process and end up with a firmer ice cream, try chilling your mixture and see how you like it, but the great thing is that you don’t have to. Another tip is to put any stir-ins (cookie pieces, nuts, fruit pieces, etc) in the freezer to chill them while your ice cream is freezing. Toward the end of the cycle, pour in the cold additions. Fast Gelato Production - 20 Minutes! High Capacity - 6 Quarts an Hour!